Dr. Alexander Ding is a renowned interventional radiologist in Burlingame, California. He received his medical diploma from the University of California San Francisco School of Medicine in 2007. After getting his medical degree, he did an internship at Santa Clara Valley Medical Center. Dr. Ding completed his medical education with a residency in radiology and a fellowship in abdominal imaging and interventional radiology, both at the same institution: Massachusetts General Hospital. He is certified by the American Board in diagnostic radiology and vascular & interventional radiology. His subspecialties are: abdominal imaging, gastrointestinal imaging, genitourinary imaging, vascular & interventional radiology. 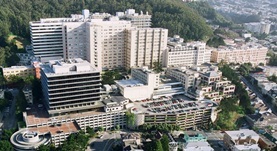 Currently, he is affiliated with several hospitals in the area, including Mills-Peninsula Health Services, San Mateo Medical Center, UCSF Medical Center, Sequoia Hospital and Stanford Health Care. He was granted the honor “Excellence in Medicine Leadership Award.” He has published some articles in collaboration with other doctors. He is a member of the following medical groups: Society of Interventional Radiology, American Medical Association, American College of Radiology, Radiological Society of North America and California Medical Association. He can speak Mandarin/ Chinese, besides English. Dr. Alexander Ding has contributed to 3 publications. Expert witness blinding strategies to mitigate bias in radiology malpractice cases: a comprehensive review of the literature. Durand, D. J.,Robertson, C. T.,Agarwal, G.,Duszak, R.,Krupinski, E. A.,Itri, J. N.,Fotenos, A.,Savoie, B.,Ding, A.,Lewin, J. S.; J Am Coll Radiol. 2014 Jul 22. Sustainable growth rate 2013: time for definitive intervention. Hirsch, J. A.,Rosman, D. A.,Liu, R. W.,Ding, A.,Manchikanti, L.; J Neurointerv Surg. 2013 Jul. Getting involved in organized medicine-a remedy for the current health care crisis? Sarwar, A.,Ding, A.,Slanetz, P. J.; Acad Radiol. 2013 Apr.